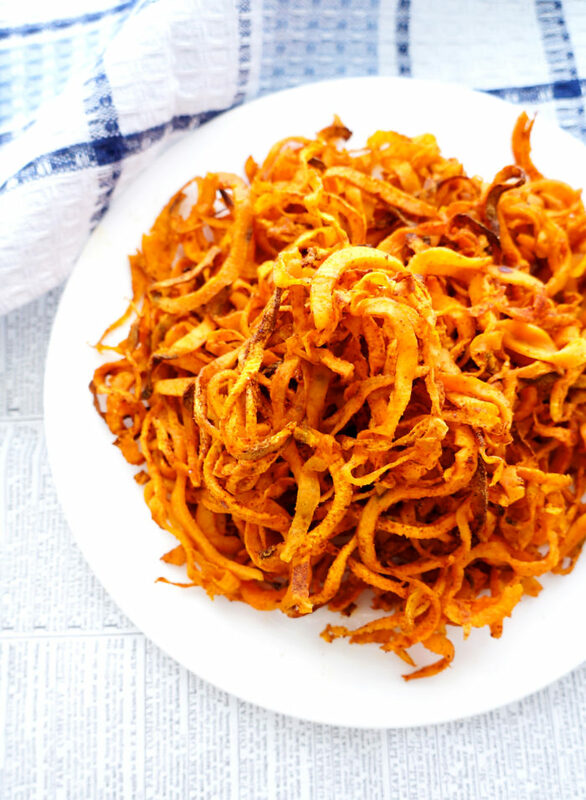 These curly sweet potato fries are the perfect healthy side, full of fibre, nutrients and a spicy kick! Watch out though– they’re addictive! 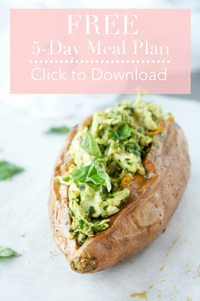 So I am super excited about this recipe today! Once again, courtesy of my handy dandy Spiralizer. I’ve said it before, and I’ll say it again. It basically transforms any vegetable into a delicious work of art. And it makes vegetables so much fun to eat! Look at that mound of goodness! Can you really resist chowing down on those crispy bits of sweet potato?? That’s totally my type of side. I also thought that this recipe was fitting for today because I feel like that heap of curly sweet potato fries illustrates perfectly what my brain looks like right about now with all of these changes that have happened in the past few weeks. Moving into a new house last week, starting a new job this week, getting engaged the week before….it’s been CRAAAZY! I’ve been relying on my quick and easy recipe go-to’s to get me through these weeks, that’s all I gotta say! I love these curly fries because I swear they taste like hickory sticks, especially when you eat the crispy bits. And the seasoning is SO delish! This is one of those side dishes that I could eat every single night. No complaints whatsoever. Sweet potatoes are also one of the healthiest foods that you can eat because they’re packed full of fibre, vitamin A and vitamin C. Definitely can’t go wrong with the good ol’ sweet potato, especially when it’s transformed into fun spirals and tastes like hickory sticks. 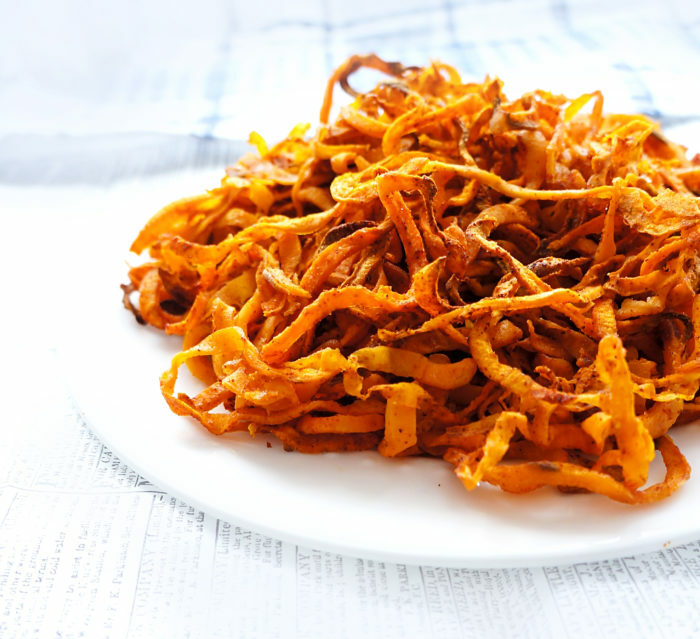 Even if you don’t own a spiralizer, you can still make the recipe by chopping the sweet potatoes into strips and throwing on the olive oil and spice mixture. Preheat oven to 375 degrees F. Peel 2 large sweet potatoes. Use the coarse blade on a spiralizer to create thick spirals. Spray a baking sheet with non-stick cooking spray. Evenly distribute spiral potatoes across baking sheet. 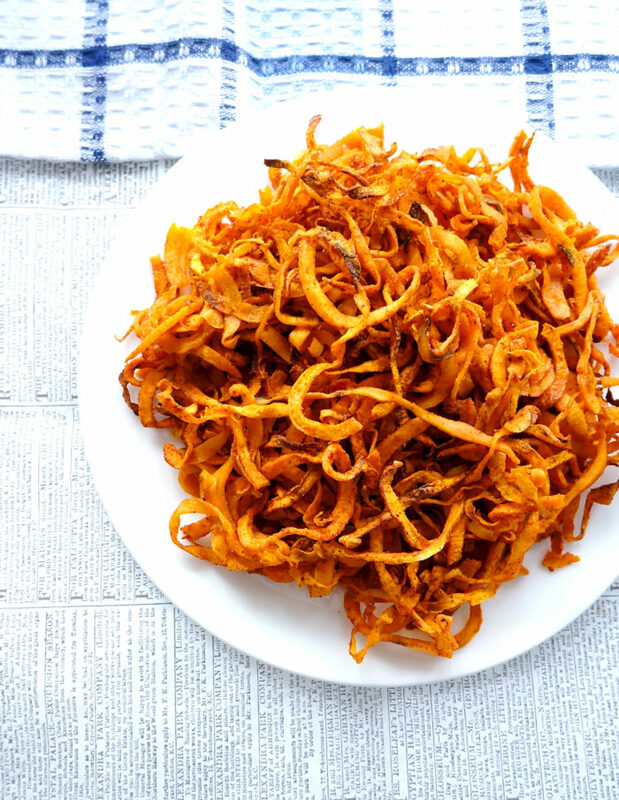 Toss spirals with a teaspoon of olive oil. Sprinkle with combined seasonings. Toss until the spirals have been coated with the spice mixture. Bake 15-20 minutes in oven, until the spirals begin to turn crunchy in places. Flip. Bake for 15-20 minutes on the other side.